Boxcryptor Company and Boxcryptor Enterprise bring the benefits of encryption to your business. You can use the cloud to collaborate securely on your company data while being compliant with internal and external regulations. Have full control over your business cloud and make sure no one but you and the members of your team can access it. Make privacy your priority to prevent any damage to your company. Get started with Boxcryptor with a free 14-day trial. If you decide to continue with a paid plan afterwards, additional setup steps are not necessary. You can get started right away without any interruptions. Boxcryptor offers all you need to protect your data in the cloud. Stay in control of your company’s data. Enable the Master Key to allow the admin to decrypt every file in your company or organization – without having to know the user’s passwords. With the Master Key, you are protected against the loss of access to you property (your files). This is important in complicated situations, for example, when a user forgets his password or leaves the company. Learn More. Comply with your security guidelines in a simple way. Define individual policies for your business, to comply with internal or external security guidelines. These policies include the option to define a minimum password length, IP login restrictions, enforcing filename encryption, and more. Integrate Boxcryptor into your workflow faster. Sync your Boxcryptor users with the users in your directory and reduce management overhead. Track the activities of your Boxcryptor users to discover important events, such as suspicious login attempts, violations of policies, or changed group permissions and take corresponding actions. Reset forgotten user passwords to prevent data loss. Due to Boxcryptor’s zero knowledge nature, a user loses access to his files if the password is lost or forgotten. Without the password, it is not possible to decrypt the user’s private key. Thus, it is not possible to decrypt the files. However, if a company administrator has enabled the Master Key feature, he can use the password reset feature. The Master Key allows him to decrypt the private keys of all users that belong to the company and to reset passwords. For more information check our technical overview. Manage your users via our web admin interface. All users and settings defined by the company can be managed by the company’s administrator in a centralized manner. Group management makes it easier to organize different levels of access to data. Set up groups inside your organization to manage, who can access and edit which files and folders. 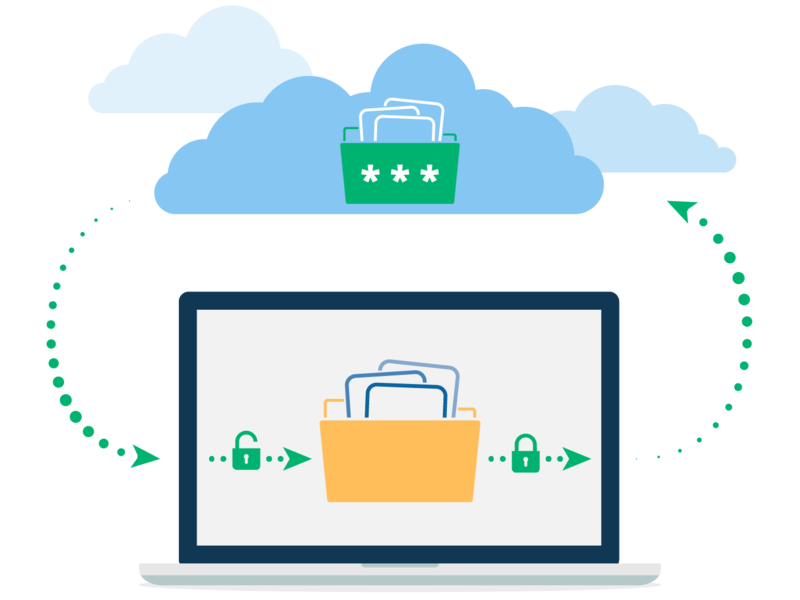 Share data end-to-end encrypted with external partners and customers. With Whisply you can share data end-to-end encrypted with external partners and customers, even if they do not use Boxcryptor or the cloud. You can set your customized expiration date for Whisply links, protect the files with an additional PIN or password and choose, over which channel you want to send the link. For teams with 50+ users. Includes all features of Boxcryptor Company and adds the following Enterprise features. Set up more efficient and simpler user management. Manage the users in your organization faster, more effective, and more secure by adding Boxcryptor to your existing identity provider, such as Active Directory or OneLogin. We gladly assist you during set-up. Contact us for more information. Enterprise administrators can now manage their encryption keys in-house. If you want to manage your own keys in-house, we can make it possible for you. Please contact us for more information on how to set this up. Have more control over your members in Boxcryptor Enterprise. Users that sign up for Boxcryptor with your company email address are added automatically to your Enterprise account. Existing Boxcryptor users with your company email address can be added mandatorily as well. Rely on our fast and reliable premium support. Talk to our support agents via email, or on the phone, whichever way you prefer. Support is available during European business hours. Your account manager will be on your side every step of the way. Contact your account manager with anything you need. Your personal account manager’s only objective is to make things as convenient for you as possible. We help you get started with Boxcryptor Enterprise, whichever way you prefer. Do you need help with setting up features, adding accounts, or with informing your employees on how to get started with Boxcryptor? We are happy to assist you in person, via video call or with any help material you might need. Contact us when you are interested in a quote, a demo, or more information.